The Harvest Festival is Soldier Creek Winery‘s biggest day of the year, held on Saturday, September 22, 2018. 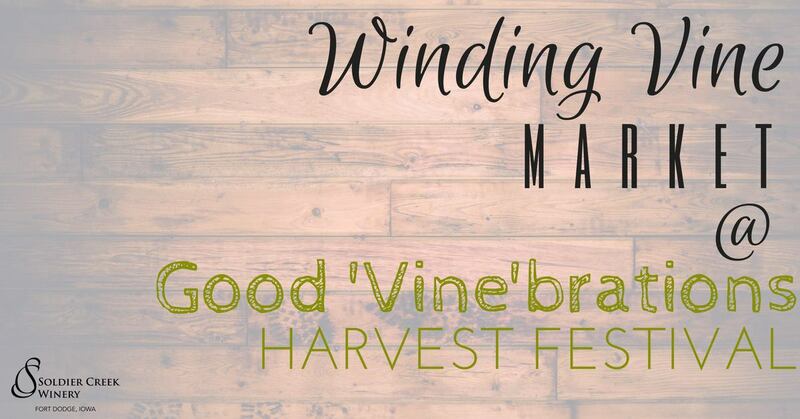 The Winding Vine Market will be open from 10AM-6PM, with other non-market activities extending until 8PM. This is a curated market, but all types of vendors are accepted: small businesses, specialty merchants, crafters, DIYers, repurposers, artists, vintage collectors, and designers. This is a market for EVERYONE! Other activities throughout the day will include a Grape Stomp Tournament, live music all afternoon, food vendors, hay rack rides, and tours. We will accept applications until the space is filled, but submit by July 1st for early acceptance.